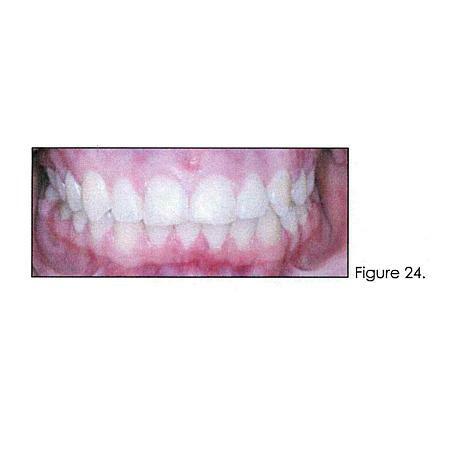 An issue we are often confronted with in our orthodontic career is the problem of impacted cuspids. As practitioners, it falls to us to be equipped to confront this condition if we are planning to treat these patients. The purpose of this review is to present an option for treatment that will address the problem of impacted cuspids. 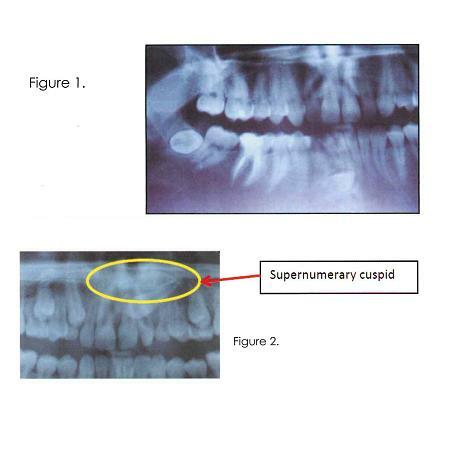 In order to achieve success, it would be appropriate to consider the cause of cuspid impaction. As most, but not all, (Figure 1) cuspid impactions occur in the upper arch, we will limit the discussion to upper cuspid impactions. Treatment of lower cuspid impactions requires more skill and finesse and may necessitate extraction rather than eruption. Since the upper cuspid is traditionally the last permanent tooth to erupt in arch, the replacement of deciduous dentition, it stands to reason that if there is an arch length deficiency, it will be manifest in that region. Occasionally, we are presented with another challenge as with the supernumerary tooth in (Figure 2) but this is an unusual circumstance. This arch length deficiency can be attributed to various causes. These would include but are not limited to things like narrow arches, Bolton discrepancies with the teeth being large, developmental issues such as cleft palate, and premature primary molar loss with mesial drifting of the permanent molars. The real issue is that either there is not enough room for the teeth or they have presented with a direction of eruption that will not allow them to erupt into a normal position. The solution is to first create enough space in the arch to accommodate the tooth and then to allow spontaneous eruption if possible or to engage attachments to guide the tooth into the correct position. 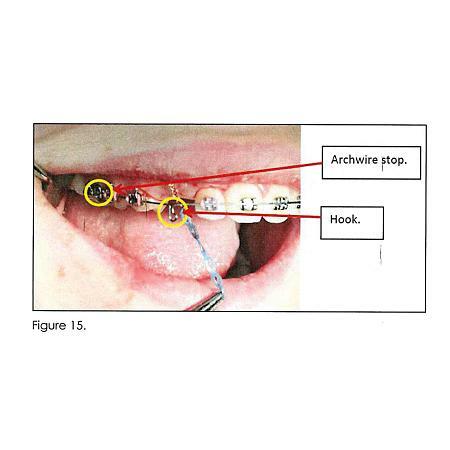 Space in the arch can be gained by maxillary expansion (Figures 3-5), distalizing posterior segments and using open coil springs in the arch wire setup (Figures 5-8) or a combination of these options and should allow for 1-2 mm more space than needed during the eruption process. This excess space can be consolidated once the tooth is in place. Spontaneous eruption does occasionally occur (Figure 6), but in a majority of patients does not. When this is not the case it becomes necessary to surgically expose the tooth and bond an attachment that will allow auxiliaries to be attached to guide the eruption. The procedure demonstrated in the article is a conservative exposure to facilitate the bonding of an attachment followed by repositioning of the flap and suturing in place (Figures 9-13) The goal is to create an environment that is most closely mimics normal eruption. 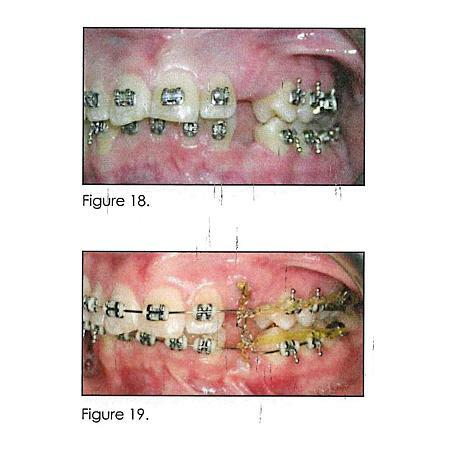 It then becomes an issue of employing bends in an arch wire and the use of elastics to guide the tooth. A hook and arch wire stop are "bent" into the wire (Figure 14). 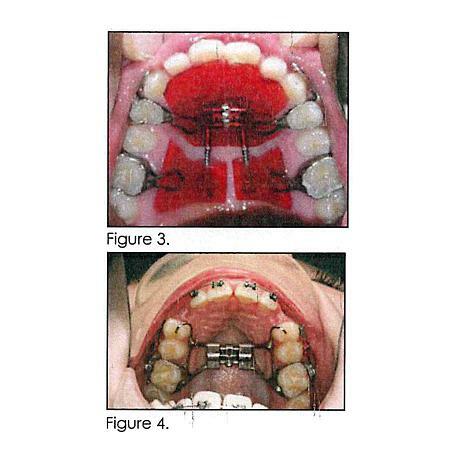 The procedure is demonstrated through photos with the key element being to place the' hook in the center of the space created for the tooth (Figures'] 5-17). 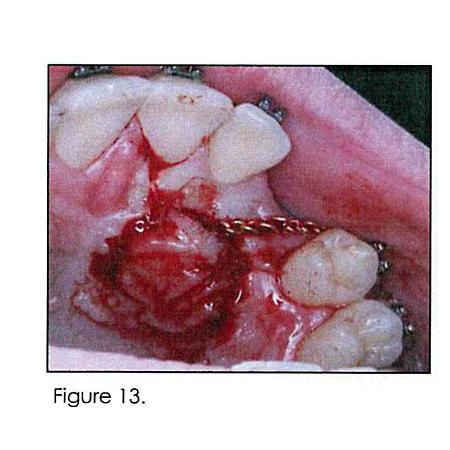 An attachment with a brass chain linked to an ortho pad is bonded to the impacted tooth. To that a segment of power chain is attached using ligature wire as demonstrated (Figure 10). 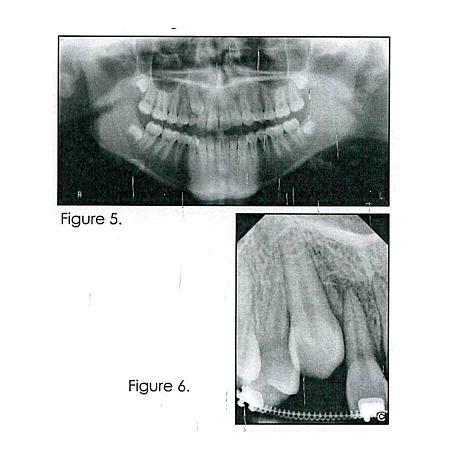 From this point, it is a matter of segmentally tightening the power chain to the hook on the 6 year molar and advancing it at the monthly visits (Figures 15-17). This setup keeps forces applied either directly in the direction of eruption adjacent to the tooth or along the occlusal plane adjacent to the molar hook (Figures 16-17). Once the tooth has "erupted" through the tissue in a decent location, it is advisable to remove the pad and let the tooth just settle for a month. As most of these teeth will come in rotated and tipped, it is then a matter of bonding a bracket and using the appropriate mechanics to correctly position the tooth (Figures 18-21). The result is a great service to these patients (Figures 22-24).